Angelo Tsirekas’ fortunes continue to sink, as the former Canada Bay Mayor has been relegated to second place on Labor’s ticket. The smooth operator was Mayor for as long as anyone could remember, and graced our covers repeatedly (even scoring Ciao’s “Mr Inner West” title many years in a row). Head of the ticket, controversial former CFMEU boss Andrew Ferguson, has been accused of branch stacking and faking addresses of electors to gain more votes. These electoral irregularities aren’t good news for the Labor fight for control of Canada Bay Council. 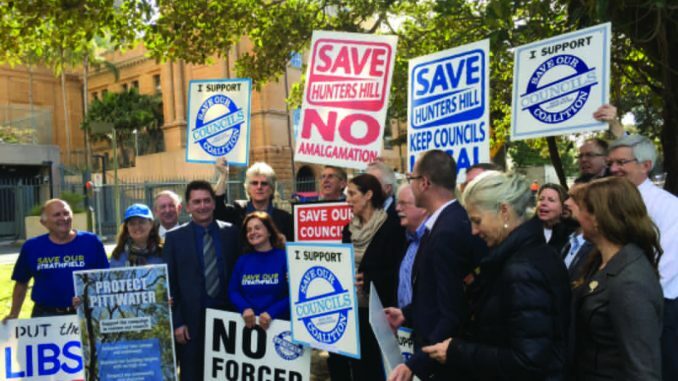 Tiny Inner West community group, Save our Strathfield, has won its battle against local government mergers after Premier Gladys Berejiklian declared council amalgamations dead this month. The people power movement began four years ago with a few angry residents. They’ve now turned into budding politicians themselves, with senior members standing for election as Independents. The group says that, without standing up to the man, “we will all wake up and find our beautiful area has been turned into a high rise hell”.